World Record driver Rainer Zietlow (48) from Mannheim, Germany is on the road again! With two Russian journalists from Auto Mail.Ru, Petr Bakanov and Klaxon, Georgy Golubev, he tries to achieve a new world record time. 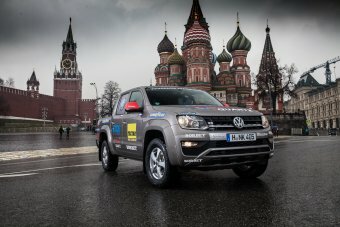 For Rainer Zietlow it will be the sixth long distance challenge and the second world record tour with Volkswagen Amarok. Rainer Zietlow chooses the new Volkswagen Amarok V6 3.0 TDI for this transcontinental trip. 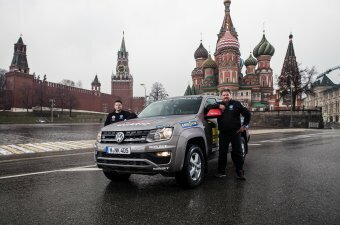 This time, he and his team intend to drive from Dakar, which is dedicated to the most famous and extreme rally raid «Dakar» to the Russian capital Moscow. They try to drive the 8000 km long stretch through four time zones in around 4 days at the end of April 2017. The most difficult part will be the 3260 km through Senegal, Mauritania and Morocco, where are a lot of bumpy sand roads, several border crossings and deep potholes on the asphalt plus camels , coats and donkeys on the road. From Senegal, the team will start on the 22nd of April passing through Mauritania, Morocco, Spain, France, Germany, Poland, Lithuania, Latvia and finally Russia, hoping to reach the finish line in Moscow on the 26th of April or earlier. Since 2005 Rainer Zietlow supports SOS Children’s Villages with each of his projects. Also this time he will visit an SOS Children’s Village in Dakar on the 20th of April to hand over a donation of 1.500 Euro which is around 20 Euro cent per each kilometre driven. Rainer Zietlow and his team will again be posting about their world record drive on Facebook, Twitter, Youtube and Instagram. This will we accompanied by hundreds of photos, daily short videos and live blog posts from inside the Amarok. The Volkswagen Amarok has no modification except an additional fuel tank and LED high-beam light in front for this endurance challenge. 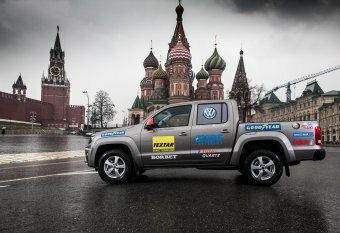 “Amarok Dakar2Moscow” is supported by Volkswagen Commercial Cars Russia and by several automotive supplier companies in Russia and Europe.